Washington, DC — Supporters of the Deferred Action for Childhood Arrivals (DACA) program are conducting a 24-hour vigil outside the White House despite administration plans to scrap the program within 6 months. In spite of President Trump’s intent to make good on a campaign promise to end DACA, a White House memo leaked on Sunday preserved hopes that political pressure can save the program. An Obama Executive Order of 2012 gave legal status to nearly 800,000 children of undocumented immigrant families. Those children, known as “Dreamers,” their advocates and supporters have been circulating a petition and maintaining a vigil outside the White House since August 20 to keep them from being deported. Advocates say that Dreamers should maintain their legal status because they had little say in their parents’ decision to bring them to the U.S. and that canceling the program is like pulling the rug out from under a government promise. It would force participants to live in the shadows, take away their jobs and put them in jeopardy of deportation, the advocates say. Many Dreamers are legally permitted to work with some serving in the U.S. armed forces, while others attend school. The children became known as Dreamers because the DACA program allowed them to attend school, find employment, apply for drivers licenses program, and in effect come out of hiding and follow their dreams. Dreamers were required to go through a rigorous application process, costing $500. The application requires them to register with the Department of Homeland Security, and they must renew it every two years. Each renewal costs another $500. The decision to cancel the program has drawn the criticism from both parties in Congress, including Speaker Paul Ryan, who said, “There needs to be a legislative solution” in regard to DACA. A poll reported that 78% of registered voters support allowing Dreamers to stay in the country. Among all voters, 65% of Democrats support DACA while 48% of Republicans support it. Independents came in at 56%. Luke Hwang, a Dreamer and DACA-protected immigrant, stood with supporters outside the White House. He said that he came to the U.S. from South Korea when he was 11 with his parents after the South Korean economic collapse of the late ’90s. His father lost his job and their only recourse was to immigrate. For years, they were forced to live in the shadows. But he said that President Obama helped change his life with the DACA program. “It gave a work permit to people like me to continue my future,” he said. Under DACA, he was able to go to the University of Chicago to study chemical engineering while working at the University to help pay his tuition. DACA allowed him to get a Social Security number, a drivers license and gain necessary legal status. 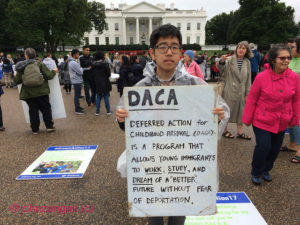 Hwang expressed fear for his future because the end of DACA means he may no longer be able to work at the University or complete his graduate study program. “If I went back to South Korea, it would be a completely new country for me. I wouldn’t call it home,” he said. Advocates are supporting Dreamers by organizing and seeking local political support. 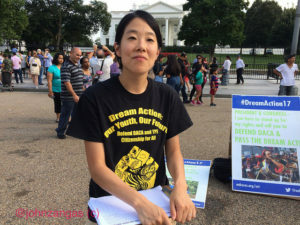 Sookyung Oh, Area Director with National Korean American Service & Education Consortium (NAKASEC), said that DACA provides no financial support to Dreamers and application costs are born by the families. The program does not allow participants to apply for financial aid. “There are strict eligibility requirements, but it gives the people who can apply some breathing room,” she said. Oh believes that the reasons for opposition to the program stem from racism. “I think that people opposed to DACA are simply ideological. It is in line with a white supremacist agenda,” she said. Oh pointed out that there were divisions within the Trump Administration over continuing the DACA program. “It is a question of what kind of values does this country want to have,” she said.